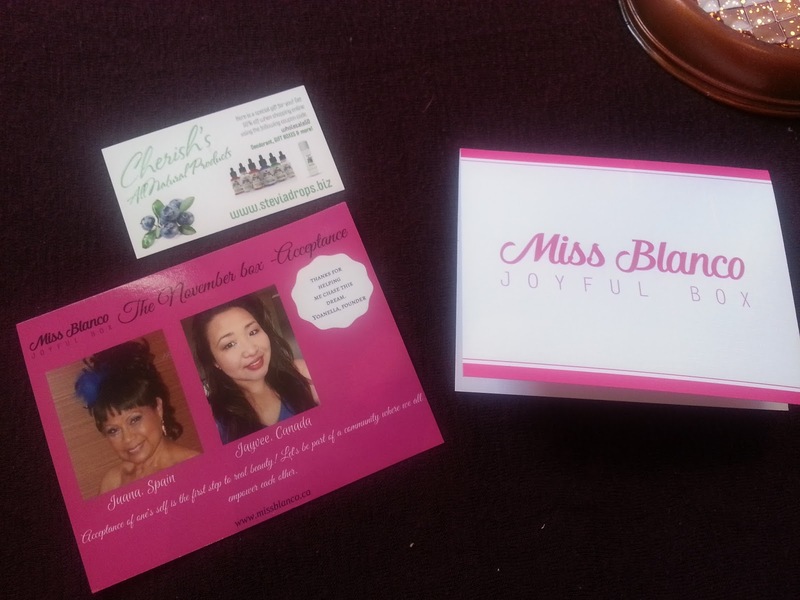 Miss Blanco Joyful Box is one of the newer subscription boxes. 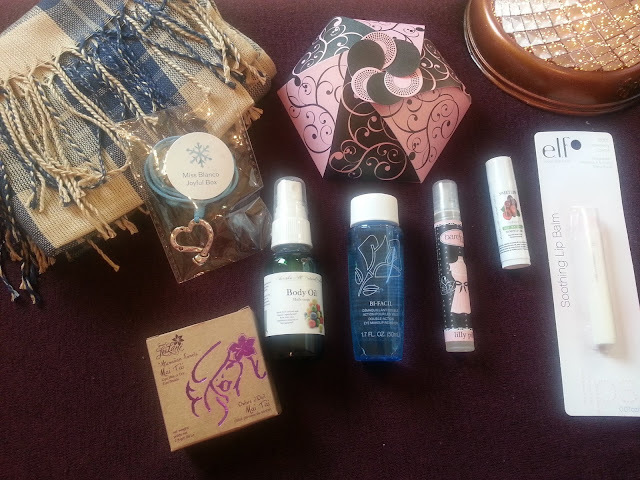 You can see my review on my first box from last month here. October was the very first month that they had launched, so this is my second box. Unfortunately, there is no customizing this box. So everyone pretty much gets the same thing, with a few variations here and there. This box retails for $38 Canadian, not including shipping or taxes. Novembers box was $49.89 for me in Ontario. A little more on the pricey side of subscription boxes. There is a promotion for Black Friday where you can get a 50% off discount on your first box, when using the promo code BFRIDAY50 at the checkout. Promo code is valid until November 28, 2016. So let's get right in to November's box. Firstly, they changed the box from white to black! You don't see this too often, and I like it! As always, a thank-you card, as well as the product information card, with a shoutout to some subscribers, and an exclusive offer from Cherish's All Natural Products. The box is full, and it was hard to get a decent picture with everything inside... so I took it all out and we'll get a better look at everything. Everyone received these in their boxes, but different colours. Mine is blue and beige. It's thin but welcomed in my clothing collection, I don't have many scarves and this will work well with many outfits. This is considered a lifestyle item in the box, and has a value of $32.99 Canadian. 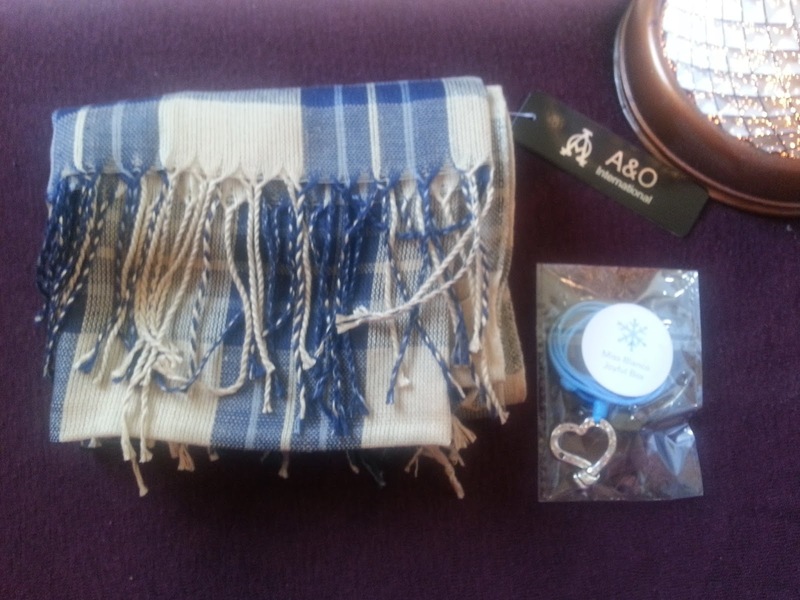 I think this was also included in everyones box, but the rope colours are different. This isn't something I would wear so I will be passing it on. 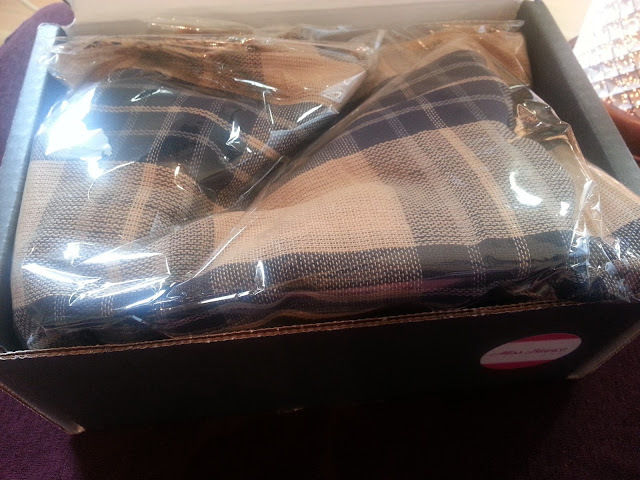 This is considered the handmade item in the box, and has a value of $20.99 Canadian. I've never heard of this brand before, so it's new to me. The shade is somewhat of a gray colour. I tried to swatch it but there is absolutely no colour payoff. And I'm like the shade of paper, so it should show. The product card included in the box, gives this a value of $14.99 Canadian. I wouldn't be happy if I paid $15 for a single shadow and that's what I got. This is a bonus item for being a VIP member (which I won - so I don't pay extra for it) and I'm happy to see this in my box. I've never tried the Lancome version, but I have heard many great things about it. I like the oil/cleanser type of eye makeup removers because they almost always get all of that waterproof eye makeup off your face, with minimal tugging or pulling at the area. Since this isn't on the product card, I looked it up on Sephora, and this 1.7fl oz size goes for $20 Canadian. When I first saw we were getting a bubblegum scented body oil, I was a little skeptical. I was afraid it would be thick, messy, and that the bubblegum scent would be strong and overpowering. I like sweet scents but you never know what to expect. However, this surprised me the most. The oil is not too thick, infact it easily sprays out of the nozzle. And the scent reminds me of sprite. It's not really bubblegum-ish, which is not a problem. It keeps my skin looking hydrated, and feels so soft and smooth. This is probably my favourite item in this box this month. The product information card has this valued at $10 Canadian. I didn't try this oil because we also received the Cherish body oil. I think it's a little much for the same month, but I guess now that we are entering colder months, you can never hydrate your body too much. Hopefully it's not too thick and has a nice scent. This is valued at $2.50 Canadian. I was a little confused as to what this was. Opening it up, it is a bath salt. Taken from the barefoot venus site, "Enter a skin softening milky sea of relaxation. Drift away as muscle relaxing salts, soothing fruit butters and spirit-lifting fragrance surround you in comfort." I don't really use bath salts but I decided to give this a try. I used half the package because it looked a little large in the bag. I didn't find that it softened my skin really, or made it feel silky. There was not much scent either. That's just the picture of the back of the box, and what the salts looked like. The value on the product card has this as $5.50 Canadian. These are the final 2 products that I received in my box. 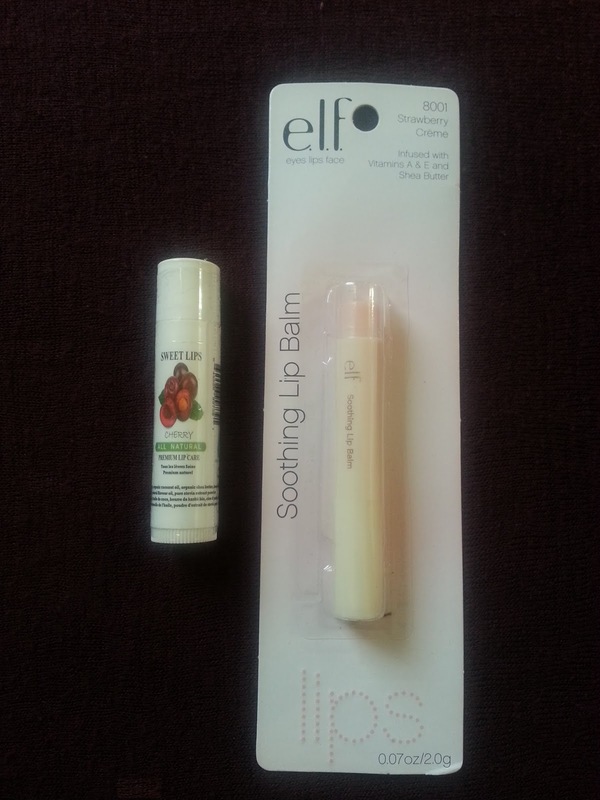 I don't mind getting lip balms in subscription boxes. They are something I always use. I haven't opened this one up yet just because I'm trying to finish another one. But I like that it is all natural, and made in Canada. 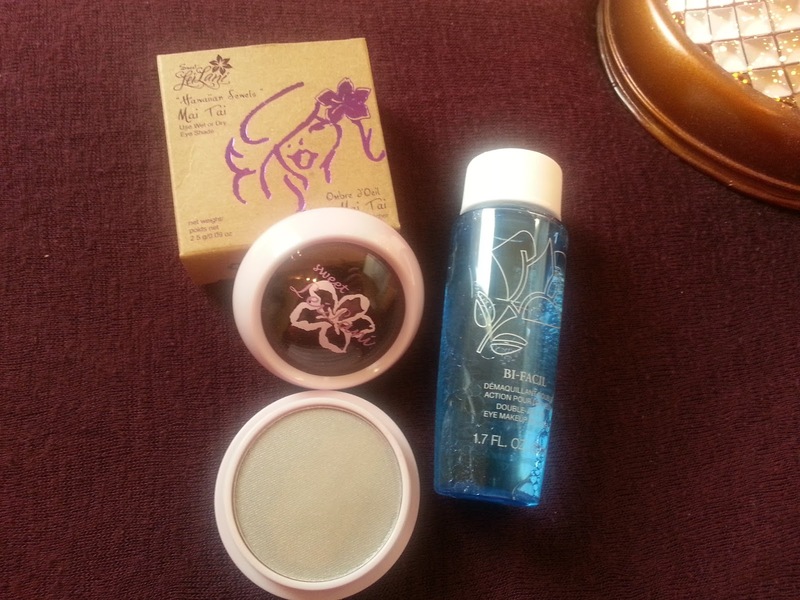 This is another product made by Cherish, and is valued at $6 Canadian. I don't mind some elf products, but as I mentioned in my October box review, it's not really something I would like to see in a subscription box. This is also a bonus item, which is appreciated, but this is valued at only $1. I will use it, and I have opened it. It smells nothing like strawberries and cream. And this is just a closer look at the product information card. 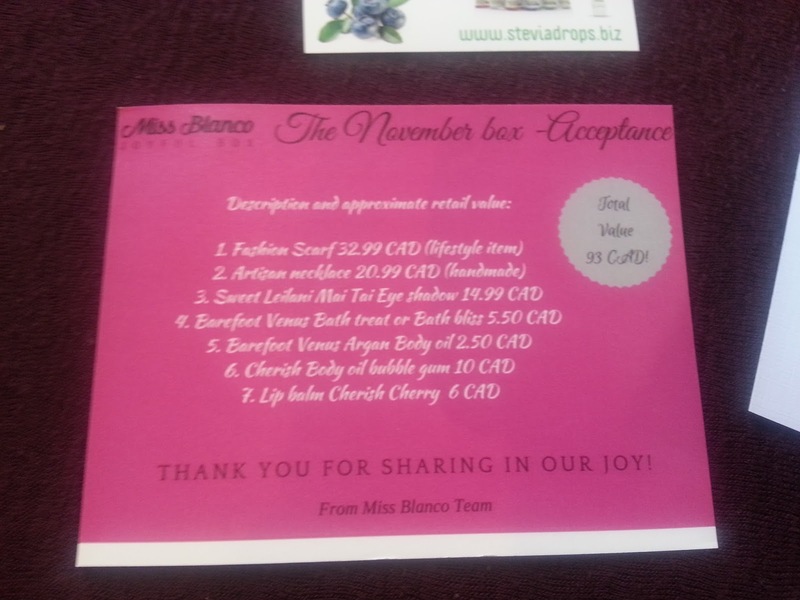 Miss Blanco Joyful Box is giving this box a total value of $93 Canadian. Overall, I hate to say it, but I'm not impressed with this box. I did some research and the scarf's wholesale price is $2.61. Giving it a $32.99 value is kind of outrageous. Two body oils in one box is a little much as well. I was hoping to see a little more variation. I like supporting Canadian businesses, but I ended up cancelling my subscription. The almost $50 a month cost is just too much for myself, and the products I am receiving aren't really impressing me. I could purchase some high-end items from Sephora for the same cost, and know what I am getting. Too bad this one hasn't lived up to expectations - I really love trying to support new Canadian businesses, but subscription boxes are a really hard market to break in to! I would have liked to keep supporting her business, but the value just isn't there for me!